Carter, Curtis, Jack Burnham, and Edward Lucie-Smith. Richard Lippold Sculpture. Milwaukee, Wisconsin: Patrick and Beatrice Haggerty Museum of Art, 1990, cat. 47. 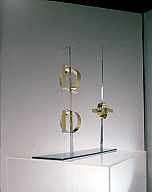 Richard Lippold Sculpture, Haggerty Museum of Art, Marquette University, Milwaukee, Wisconsin, November 30, 1990–February 17, 1991.